If you are looking to dress up your window affordably and stylishly, custom made valances can really make a big difference. You can perk up the style quotient in your house quite effortlessly with these. What’s even better is these are quite easily available. Curtain Valance is an upper part of the window fabric which can be hung alone or paired with curtains or blinds to serve as a upper window decoration. Its length should be 1/4 of the curtain height plus additional one inch. There are many advantages of custom made curtain valances. Boost Aesthetic Quotient:This is essentially a very simple way to make your house look stylish. 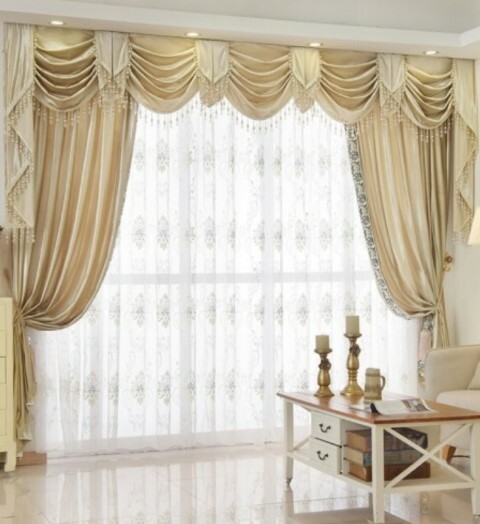 These curtain valances immediately make your home looks extremely attractive. Practical: This is a rather practical option. It does not need too many accessories, and you can easily fix them. The overall process is not very time consuming either. Affordable: You can have different types of custom-made curtain valances. This makes them extremely. You can easily choose the design and the fabric depending on your budget. Versatility: What’s even better is that there are no set décor themes that you can use them for. They look pretty in your bedroom as they look in the kitchen or living area. In fact, even in several commercial setups, they can add an element of glamour. There are many types of custom made valances. You can choose them as per your home décor and personal preference. 1. 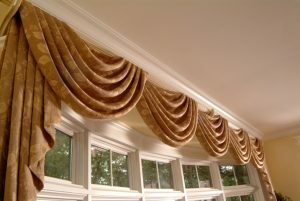 Swag: As the name indicates, these custom made curtain valances are layers over the curtain in swags. Depending on the space you are covering, you can customize the swag and determine the tail length. 2. Flat: They fall completely flat on the curtain. These are best suited for official areas. They lend a sense of somber stylishness to the entire room. 3. Inverted Pleat: It is a self-explanatory valance style. The pleats are wide and inverted. Whether you use these in your living area or kitchen, they are extremely functional and easy to maintain. 4. Pinch Pleat: These mirror the look of a pinch pleat curtain. Therefore, this type of Custom made curtain valances can easily enhance the room and the window you dress it up with. These work well in homes as well as offices. The question then is why you should hire us if you want to put up custom made curtain valances. Well, there are many reasons. Customized Options:We are the market leaders in customization. Our custom made curtain valances speak volumes about our expertise in designing, tailoring, and ultimate execution. Affordable: But at the same time, we are conscious of our client’s budget. Our designers always make it a point to offer products within budget. Our products are decidedly cost effective in the market. Quality:We could be offering at a competitive rate, but we make sure that the quality of our products is always the best. Quality is always the first things that we concerned. Less Time:This is our unique selling point. We make sure that we stick to deadlines and never disappoint our clients on this accord. Their satisfaction is our biggest reward. So if you are keen on installing custom-made curtain valances, contact us today. We promise to provide competitive options within a very short period and 100% satisfaction.